– Sheryl Nussbaum-Beach noted that this year’s conference was not the same “love-fest” as the one the previous year. 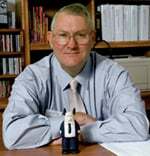 – Jeff Utecht felt the conference had outgrown its effectiveness and was too fast paced. – Vicki Davis stated that she felt overwhelmed and unimportant after the conference. Will’s words rocked me a little. I am a bit of an early adopter, and many of the bloggers I follow are either innovators or early adopters themselves. But it seems many are becoming irritated by the slow pace of change. We need to collectively remember that while much of the social media and web-based instruction is no longer new to us, it is still relatively new to the majority of our colleagues. And that suggests we still have work to do! I agree! I also liked the tone of Stephanie Sandifer’s blog where she urged us to become more proactively vocal in reaching newbies and the majority. We are the minority, but we have seen the potential. Let’s keep plugging away! Thank you so much for this post. This is an excellent post and I appreciate seeing the adoption information again — I had forgotten those percentages. What a great chart and it is a reminder not to be frustrated. I think it is tough when one presents a lot at NECC b/c it is great to share, but sometimes we need to have takeaways too. This year, my takeaway was being a bit overtired I think b/c I took my family! Great post. You have a lot of common sense and great insights. I always enjoy reading your blog. Right on, Britt! It is very easy to fuss about slow acceptance of new methods and tech, but my experience is that it takes a few tries before I get it right. Then I have to change what I did because it is still not working as well as I want. I am currently attempting to revamp ALL my lecture PowerPoints into video accompaniments. More pictures, less words. Obvious now, but not at the time. Sigh. Persuading by examples is always more powerful than persuading purely with argument. Your post was very timely for me. Just this afternoon I decided to talk a bit about the laggards and late majority in a panel discussion at the D2L conference in two weeks. I was going to search for the source of the bell curve – but there it is in your post. I too suffer from some of the angst related to glacial change (although don’t look now – the polar ice cap is melting), and wish the world was a bit more fast twitch. I attended NECC two years ago (San Diego) and this year I also followed many of the A-listers who attended. I’ve always known that it is a bad idea to take family during the conference proper (add on a few days at either end if you can) and I also think that NECC is just too darn big. I get so much more value out of the 500-1000 attendee conferences where you don’t feel like you must go 100 mph. Don’t forget to send in proposals for ITC e-Learning 2009 in Portland! Later. Thoughtful post Britt, as always I appreciate the way you are able to draw together ideas and connect resources and perspectives. We have had several conversations about the “long nose of adoption” and the role this seems to play as an innovation makes its way through different levels of adoption…or not. I think you correctly identify that those of us on the “Innovator” and “Early Adopter” end of the curve have grown accustomed to exploring innovations on a daily basis. This has an impact on our own daily work of exploring and evaluating these innovations for potential educational use. I think there has also been trend over the last year or so for folks in the edtech camp to hunt and gather the latest tools, to be the first at the site and to announce it and pass it along. I think this has been a fun and fascinating time, but it may have come to define too much of the work we engage in. 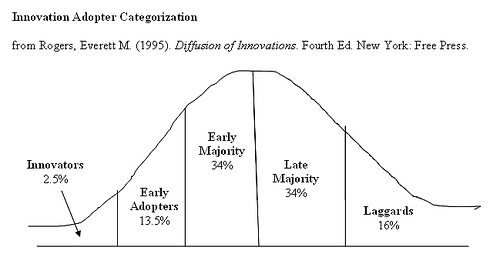 One of the things I have always sensed about Rogers’ adoption model is this…the excitement and interest that innovators and early adopters share in the early stages of using the innovation is not often shared by the early and late majority bands. These adopter groups tend to come to the table for different reasons. This creates an adoption dilemma for those of us involved in the work of sharing the potential educational benefit of an innovation. The language of the innovator is often a second or foreign language for the early and late majority. It seems to me that the real challenge in supporting the diffusion of an innovation lies in our ability to engage in some translation that can serve to support broader adoption. I’m looking for good examples or where this translation is taking place and having an impact on supporting adoption of innovations. Ultimately, I’m not sure there has been enough time to track this yet…it takes years. We may need to find some balance b/t the “innovation-a-day” expectation and the challenging work of slowing down, reflecting, translating and being comfortable with sharing as new something that may have become a well-worn shoe for us. Great comments above (and part of the conversation shifted over to Colin’s blog!) I hope Barry blogs his panel discussion, as that should be very interesting! In looking at Jeff’s thoughtful comment (which rates its own post on his blog! ), I am reminded of something Jeff mentioned last spring….that most adoptions follow a ten-year cycle from innovation to mainstream acceptance. That may be speeding up, but then again, I am still waiting for my flying car that was promised back in the Fifties!